Protected and blessed by Mata Vaishno Devi, who seems to have found her earthly abode on the Trikuta Hills, Jammu City is indeed amongst the top places to visit in Jammu & Kashmir. 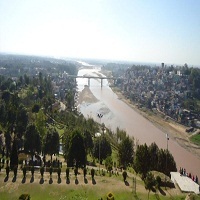 Dubbed as the City of Temples, Jammu invites those seeking peace and tranquility. The unmatched divinity at Raghunath temple, Ranbireshwar temple, Mahamaya temple, Peer Baba and Peer Khoh touches every corner of Jammu invigorates visitors. One must visit the Bahu temple, which is situated inside the majestic Bahu Fort. The temple is dedicated to presiding deity of Jammu, Goddess Kali or Bawe Wali Mata as she is popularly called in the region. Besides the temple, a travel enthusiast can witness architectural grandeur of Bahu Fort and Mubarak Mandi Palace. The Aquarium at Bagh-e-Bahu (Bahu Fort) also catches the eyes of the tourists as it is the largest underground aquarium in the country. A trip to Jammu is no less than an expedition to a holy land.